About Kanopy: Kanopy Streaming offers a remarkable variety of over 26,000 award-winning documentary, educational and feature films from an impressive array of producers and distributors including, but not limited to, Media Education Foundation, Psychotherapy.net, California Newsreel, and the Center For New American Media. Streaming videos available cover a wide variety of subjects such ranging from the arts to business and from psychology to media and popular culture. These streaming videos are available on a 24/7 basis from both on and off campus and are also available to be used in the classroom or in online classes. Full length streaming video, currently with public health and sociology titles. Select Collection Development: David Feinmark from the drop down menu to send a message directly to him. This semester's library newsletter, the Buley Bulletin, is all about the new library spaces. The new Quad side entrance is open. The new Learning Commons with Circulation Desk, Reference Desk, OIT Helpdesk, and computer areas is just inside the entrance. The old computers and all the book shelves are still located in the back (street side) part of the building. The street side 4th floor is under construction for the Library Director's offices, staff lounge, new computer area, study rooms, and seating area. Some of the room numbers in the street side part of the building have been changed. Please see the Library Floorplans for updates. Some offices from Wintergreen have moved into office space on the 2nd, and 3rd floors, and into the Reading Room on the 4th floor. The renovations in Wintergreen are anticipated to take 9 months. The Cafe is not open yet, pending the food service contractual arrangements. Update 1/20/15: The 4th floor computer lab is closed for the semester. The plastic walls have been pulled back on most floors, opening the spaces by the elevators. Watch for info on offices moving and an opening date! Follow the signs hanging from the ceilings on each floor and use the corridors through the shelving and the passways along the window wall. With the increased traffic near the seating areas, please be courteous to your fellow library patrons and do not block the walkways by dragging chairs around. Thank you! Traffic flow will be similar on the other floors. Update 10/22: What happened to the printers and scanner? It's all still here! The first floor printers are now on the other side of the pillar. The scanner has been moved to the alcove by the windows (to the left of the Reference Desk and display case), and the document magnifier is right next to the Reference Desk, under the clock. The Library Catalog kiosks are still in the same places, one by the printers and one in the alcove. The plastic temporary wall will be going up on the first floor shortly. It's already up on the ground and second floors. Update 10/17: The maze outside is looking much better, but the maze inside is about to get worse! Starting next week, workers will be putting up plastic sheeting along the temporary wall on all floors, to prepare for opening the connection to the two buildings. These areas have been the main passage ways on all floors, so you'll have to take some detours. The elevators and the bathrooms on all floors will remain accessible. As we find out more, we'll post it here. The construction crew will be "breaking through" the temporary walls between the old and new library spaces, starting this week on the Ground floor. It will be dusty and noisy. Thank you for your patience! "On the construction side, we have some issues with site work for Buley Library. The contractor will be moving the fencing on the West Side of the Library (Adanti Student Center Side) and installing a temporary bituminous walkway in order to address sidewalk replacement issues. The current sidewalk near the entrance of the Adanti Student Center does not meet ADA standards for accessibility. The grade is way too steep. The current concrete sidewalk will be removed, the area regarded and a new sidewalk poured. There will also be additional site work completed to address drainage in the area. All of this should take 4 to 6 weeks to accomplish." After a summer of limited access to the quad, the patio and walkway work has been finished and the fences moved back again. Just in time for the start of the fall semester! The construction is proceding very well: the brickwork is almost finished, most of the windows are in, and they are preparing the floors inside the building. Check our Facebook page for pictures of the recent staff tour of the inside of the building, and for additional pictures as the construction continues. 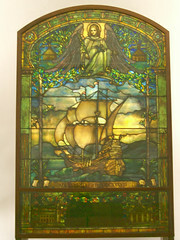 We got word on Friday (3/7) that the plans for our Tiffany windows have been finalized. 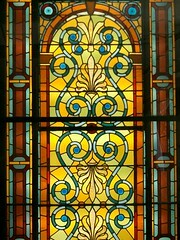 The three arched windows from the First Church of Christ in New Haven will be on the South side of the first floor of the renovated section of the library, near where the Reference Desk and computer area will be. 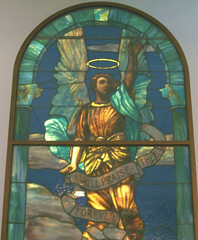 The Congregational window also be on the south side, but in the two level reading area that starts on the second floor of the connector between the two buildings. Both locations will illuminate the windows with natural light during the day and should also be visible at night from the outside. These pictures were taken in 2005 by librarian Rebecca Hedreen (in the old building before construction started). The windows were donated to the University in the 1960s and installed in Buley Library in 1972. Two of the windows are currently being cleaned and restored by Serpentino Studios (scroll down to the bottom of the page for our windows). The rest of the library construction is going well and on time. We are pleased that our public elevators are in use again! Construction of Elevators C and D lobbies continues. ; Scheduled completion date February 14th. Elevators to be turned back over to the University when completed. The installation of glass walls in the connector has started and is well on its way. Pre-cast panels have been received, approved and installed on the side of the front entrance ( not visible at this time). Installation of pre-cast panels will continue on the front of the building. New chiller/air conditioning unit has been installed and piping will begin this week. New air handling units have been lifted and installed in the penthouse and currently are being piped and wired. New roofing material for the mechanical penthouse is on site and new roofing will begin as soon as weather permits. New stair “a” installation has started with the lower level connected to the first level. Installation will continue, connecting all floors. Installation of sprinkler system piping has been completed on lower level and first floor. Piping to continue on floors 2,3 and 4. Drywall framing is complete on lower level and level one. Electrical wiring is being installed and both levels should be ready for drywall installation in the next 2 weeks. HVAC duct work is complete on both floors. Installation of toilet carriers, storm drainage and vent piping continues on all floors. All new duct work for floors 2, 3 and 4 has arrived on site and installation will begin immediately. Additional items, too numerous to list, are being installed, tested etc. contributing to the over-all success of the project. Good News: we are on schedule for a late fall 2014 completion of the lower level and 1st floor. Floors 2,3 and 4 are on schedule for an early Spring 2015 completion." Once again I want to thank the Campus Community for all their patience and understanding with all the construction taking place on Campus. I especially want to thank all of the staff housed in Buley Library for their cooperation. Everyone has been great despite all the inconvenience." - Ground floor: Microfilm and readers are in the center table area. - 1st floor: the Reference Desk is by the windows (with one scanner); computers are where the study tables were; the printers and 2nd scanner have not moved. The Hootloot machine is still not working! - 2nd floor: the computers are by the windows; the study room opposite the public elevators is down a little corridor. - 3rd floor: the Learning Resources Center office has not moved (it's down a little corridor); equipment is in the center area. - 4th floor: IT offices have moved across the hall. - All floors: the regular elevators are closed. Please use the staff elevator behind the regular elevators. Follow the signs! The Library will be closed to the public Wednesday, November 27, 2013 (the day before Thanksgiving) to allow the moving of the Reference Desk, computers, and other stations. Librarians will be available to answer questions via the Ask Us service, http://libanswers.southernct.edu until noon. The Reference Desk phone (203-392-5732) will not be available, please call the Circulation Desk (203-392-5756) for phone inquiries. "Happy Thanksgiving everyone. Our best to everyone and thank you for your patience with all the construction taking place on Campus. One of the things we have tried to do is schedule construction activities that are disruptive to the operation of the University in off hours of operation. For the most part we have been able to do so, utilizing weekends and holidays. We will continue to do so during the up-coming Holiday Season. On Friday, November 29th, we will be shutting down the domestic hot water to Buley Library to install new piping. The Library is closed on Friday so this should not be a problem." On Wednesday, November 13th, a construction crew will begin installing temporary walls on the 4th floor of the library to enclose the Library Science computer classroom and make it ready for use as a swing space for IT personnel. This work will not be a disruption to the 4th floor computer labs that are adjacent to this space. Work should take a few days to complete. On Thursday, November 14th, electricians will begin installing power poles on the 1st and 3rd floors of Buley. The metal poles will span from the ceiling to the floor and will contain power outlets and data cords to be used for the relocation of the computer and reference area on the 1st floor and the media area on the 3rd floor. The power poles will be located in the open seating space [table areas--HCBL] between the book stacks in the center of the building. Work to install the power poles will take 3-4 days to complete. This should be a minor interruption to the library. On Tuesday, November 19th, the microfilm cabinets and viewers located on the ground floor of Buley will be moved from their current location to the open seating space in the center of the building. The viewers will be relocated to the outer wall on the Fitch Street side [by the big windows--HCBL] of the building adjacent to the relocated microfilm cabinets. Also, on Tuesday, November 19th, the three computer carrels located on the 2nd floor of Buley adjacent to the elevators will be relocated to the outer wall on the Fitch Street side of the building. Also, some existing furniture located on the fourth floor of Buley will be removed from the building to make space for relocations. On Thursday, November 21st, three IT work spaces and a few IT personnel on the 4th floor will be relocated to the former Library Science computer classroom adjacent to the 4th floor computer labs. A storage room for Library Sciences will also be moved out of the soon to be construction zone. On the 3rd floor, the media area will move from its current location in front of the elevators to the open seating space in the center of Buley between the book stacks. On Monday, November 25th, the passenger elevators in Buley will be shut down for a period of time. Signage will be in place to direct occupants to use the service elevator in the building. Also on Monday, November 25th, construction crews will begin building temporary walls on the ground and 2nd floors of Buley. The wall will run north-south, parallel to Fitch Street at the passenger elevators to isolate the building connection area from the occupied portion of Buley. A hallway from the stacks to the temporary wall will be maintained on each floor. It should take 2-3 days to install the temporary walls. On Wednesday, November 27th, the reference desk and computer labs located on the 1st floor of Buley will move from its current location to the open seating space in the center of the library between the book stacks. The reference desk will move to the outer wall along Fitch Street and the computers will move to the center space. The computer lab on the first floor will be closed for Wednesday. Also on Wednesday, November 27th, temporary walls will be built on the 3rd and 4th floors of Buley. Like the Ground and 2nd floors, the walls on floor 3 and 4 will span north-south, parallel to Fitch Street at the passenger elevators to isolate the building connection zone. It should take 2-3 days to install the temporary walls. On Friday, November 29th, construction crews will install a temporary wall on the 1st floor on Buley Library. This work should take 1-2 days to complete. During the first week of December, there may be some minor noise related disruptions to Buley Library as the construction crew continues to build out the wall on the construction zone side of the wall to further isolate the occupied area from the construction work. "BULEY LIBRARY RENOVATIONS: Work on the connector will continue with the pouring of concrete floors. Masonry walls will continue to be installed. Mechanical systems conduit piping will continue to be coordinated and installed by subcontractors. Meetings will take place with Library staff to develop plans for relocation of services in preparation for breaking through to the new addition and connecting both buildings. Construction of temporary wall and break through to the addition scheduled for some time in November. Plans and a schedule being developed to construct new loading dock(work will require a shutdown of temporary employee entrance for a period of 48 hours). -- Robert G. Sheeley, Associate Vice President, Facilities"
"Renovation to Buley Library: Probably the biggest issue on everyone’s mind is “what is going on with Buley Library”. I am happy to report that the project is moving once again as evidenced by the demolition that has taken place over the summer. We are 95% complete with the demolition. Still some work to be done in the lower levels of the building with a demolition completion date of September 28th. windows, exterior brick walls, new mechanical and electrical system, etc. If we stay on schedule construction should start in December 2012 or early January 2013. Construction should take approximately 18 to 20 months with a projected completion date of September 2014. Currently we are looking at tenting and scaffolding the entire building to possibly shorten the construction schedule and protect the building. In the meantime we have been reviewing over 200 drawings and well over 500 pages of written specifications for the renovations. Reviews have also been conducted by the Office of the State Fire Marshal and the Office of the State Building Inspector. Meetings were held throughout the summer to review comments from all parties as they relate to fire and building codes and sustainability initiatives of the University. Drawings and written specifications were revised to reflect necessary changes. Cost estimates for construction are currently under review and are over budget. Cost cutting measures are being developed for consideration. 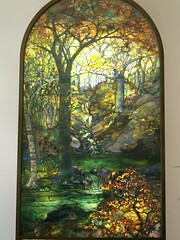 Bids are scheduled for release early October 2012." Students can help their community and reduce their Buley Library fines at the same time. 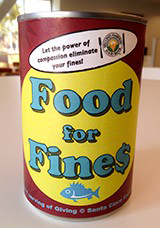 For each can of non-­perishable food you donate, the Library will waive $2.00 off your current fines, December 2-20. 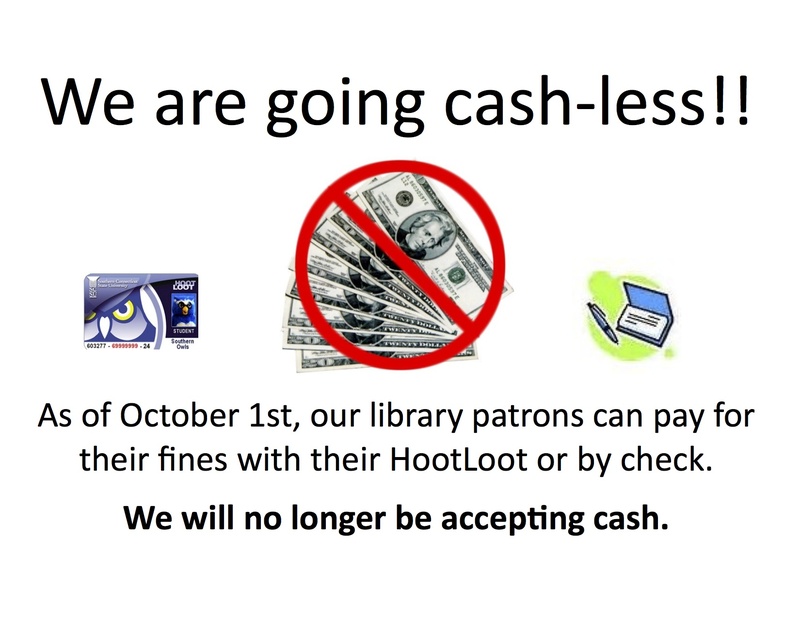 As of Oct. 1, 2015, the library will no longer accept cash for the payment of fines or fees. Only HootLoot or check/money order will be accepted. April is both Mathematics Awareness Month and National Poetry Month! Come check out our displays at the library through the end of April. Follow our Facebook, Twitter, or Google Plus pages for more resources for both these celebrations. The Math Awareness display (left) is by the Reference Desk and National Poetry Month display (above) is by the front entrance. Hilton C. Buley Library has been awarded a grant from the National Endowment for the Humanities (NEH) and the American Library Association (ALA). Our library was one of 842 libraries and state humanities councils across the country selected to receive Bridging Cultures Bookshelf: Muslim Journeys. In Connecticut, 10 libraries were selected, with only 4 academic libraries chosen to participate. Our library’s film and book collections were strengthened with the arrival of 25 books, 3 documentary films, and a one year subscription to Oxford Islamic Studies Online provided by the award. Librarians, cultural programming experts and scholars provided their expertise and were responsible for selecting the most reliable and authoritative sources. The collection is arranged in five broad themes: American Stories, Connected Histories, Literary Reflections, Pathways to Faith, and Points of View. Additional resources such as bookmarks, bookplates, and posters will be sent to our library to advertise our programs and resources. In connection with this grant, Buley Library will display some of the Bridging Cultures Bookshelf in the exhibit case on the first floor of the library. This exhibit will introduce readers to the diverse perspectives of the people, histories, religions, and cultures of Muslims in the United States and around the world. Several Buley librarians will collaborate to develop a Muslim Journeys LibGuide that introduces our students and faculty to the print and online resources available at Buley Library. This guide will be available online for public access. Throughout the year, the Friends of Buley Library will host a variety of free events and programs that will feature some of the resources in Bridging Cultures Bookshelf: Muslim Journeys. So far, the Muslim Student Association and Dr. Steven Judd, Chairperson of the History Department, have agreed to participate in a variety of lectures, film showings and other activities on campus. In the community, the New Haven Free Public Library will partner with us to sponsor a program to engage the New Haven community in a conversation about cultural diversity. We hope that these events will encourage the Southern and New Haven communities to explore the diversity of Muslim culture and experience. The Bridging Cultural Bookshelf: Muslim Journeys will help the library become a place of cultural exploration and discovery. Buley Library is committed to cultural diversity and fostering learning experiences for everyone. All events will be open to the public and community participation is encouraged. A limited number of CT state tax forms are available in the library. More extensive selections, including federal tax forms, are available online via the Government Information Guide: Tax Information. Our second event celebrating our Muslim Journeys Grant (see below) will be co-hosted with the Muslim Student Association. Check our flyer for complete details..
As of Monday morning, August 26 all library database access is down for both on campus and off campus access. We are working on the problem and hope to have it fixed as soon as possible. Update 10:30am: Off campus access seems to be working. On campus access is still a problem. Update 3:30pm: On campus access has been restored. Thank you for your patience! Our subscription to WestLaw's Campus Research has expired and we are now offering LexisNexis! The library now has a new citation helper, EasyBib! EasyBib guides you through the citation process, and has lots of tutorials for research and citation. Easy import of articles and books using DOIs and IBSNs, note taking, and a searchable database of citations (not full text) used by students around the country. For more advanced citation management, try our other citation management systems, EndNote Web and Mendeley. This may well be our most popular Facebook picture ever. Join us on our social media sites to see this and more fun and informative posts! Students can help their community and reduce their Buley Library fines at the same time. For each can of non-perishable food you donate, the Library will waive $2.00 off your current fines. Overdue books must be returned to the library for your donation to count as a payment of fines. Food for Fines can’t be used for any lost materials. The Library is hosting a Faculty Author Reception Friday, Sept. 21, from 7-9pm as part of the President's Inauguration Week. Join us to celebrate more than 50 faculty authors. Library Digital Collections back up! Buley Library Digital Collections include digital objects from the library's special collections and items from other partnerships. Current contents include the David C. Libbey Postcard Collection and issues of Connecticut Libraries Newsletter. We are switching our Journal Linker to a new system. The change-over has started, though both systems are working. In some cases, the Find Article @ SCSU links in databases will still go to the old system, which is not displaying Article links, only links to the journal. Please click through and search for the article by title or date. In Google Scholar, if you previously selected the 'Full-text at Buley Library' links to appear, you will need to reset this. Update: It looks like you need to reset this in all cases. Go to the Settings menu (the gear icon), choose Library Links, and look up Southern Connecticut. Choose the option with 'SCSU Journal Finder' for the new journal finder (which does include direct article links). If you wish to continue using the old one, you can leave that checked. (You can also add other libraries, if you have access.) If you select more than one journal linker, the others will appear in the 'More' menu below each Google Scholar result, not in the right column. Thanks for your patience during this transition! Update 2/5: You should start seeing icons for the new system in the databases. Where possible, they will use the same Find Article @SCSU button as before. Also where possible, we will leave links to the old system--this will help us work any quirks out of the new system as fast as possible. Please report errors and inconsistencies using our Ask Us services. Thank you! Due to a miscommunication between Google and one of our vendors, most of the links in Google Scholar to our subscriptions ("Full-Text at Buley Library") are down. While the problem is fixed (according to our vendor) Google won't update until next Thursday. In the meanwhile, on campus you will still see links to iConn (the CT DIgital Library) resources and Proquest Full-Text resources that we subscribe to. 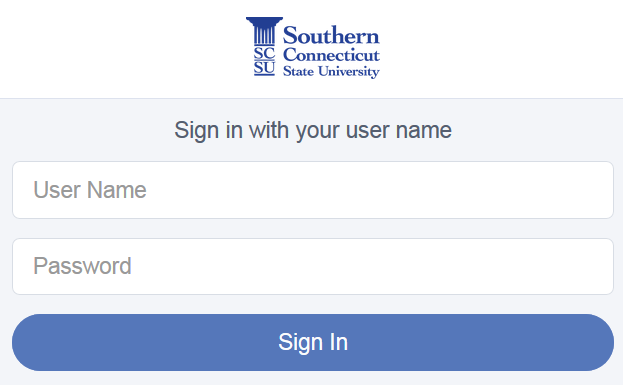 Off campus you can add these options by going to Settings, choosing Library Links, and searching for 'iConn' and chosing their options and 'Southern Connecticut' and choosing the Proquest option. On campus, the main GS results links into ScienceDirect/Elsevier, JSTOR, and our journal publishers should work normally (subject to our subscriptions). If you have any problems or questions, please Ask Us! Beginning Monday, Dec. 19, 2016, the library will start shifting database logins to SailPoint--just like Banner and other campus logins. Old links and logins will still work during the transition. This is step one in our upgrade to our new catalog and library system. The new catalog became available Jan 9, 2017.